This is intended to be helpful information for those looking to change/upgrade headlamp bulbs. I'm combining the data I've collected and posted in several threads for easier reference. First off, the stock bulbs are 9012. You can replace it with other 9006 bulbs (though you may need to trim the tabs in some cases), but because the stock bulbs are HIR, they have a higher output than the standard 9006 at the same wattage. HIR is Halogen Infrared Reflective. It is basically a coating that reflects the energy back into the bulb and increases the heat of the filament without using more wattage. * Color is measured in Kelvin. Pure white is considered to be about 4800k on a 35W HID. ** Lumens is a measure of the visible light. Changing the color on bulbs with the same wattage/type will affect the lumen output of the bulb. 35W 3000k is what you would get for fogs if you lived in an areas with fog. Anything over 6000k will impair your night vision, not improve it. In my personal opinion, the 55W AC-ballast HID is the best overall option if you're looking to significantly increase light output and want something that's going to last a decent amount of time. 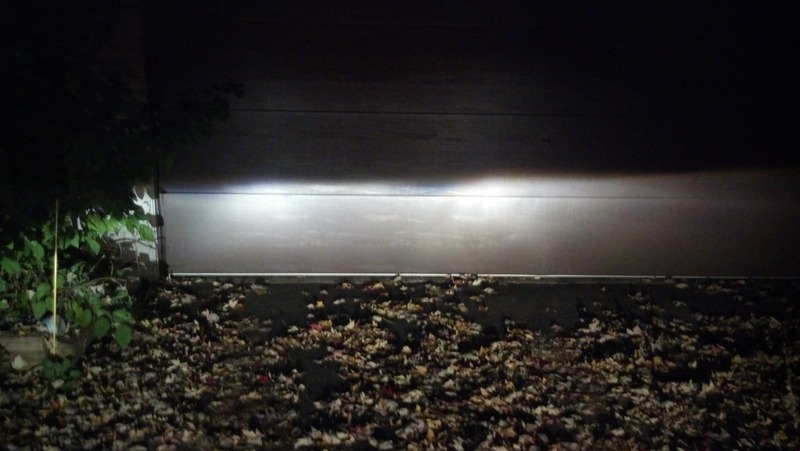 I should also note that using a 55W ballast on a 35W HID bulb will result in about half the lifespan of the bulb. With how the stock bulbs are, they're already brighter that most of the "Extreme-White" aftermarket bulbs as far as lumens go, they just have the yellow-ish color because of the bulb type. I did some tinkering around last weekend. I have some Silverstar Ultra 9005's that I modified to work in a 9006 slot and they happened to fit in the dart. (I used the 9005 because it doesn't have the tip blacked out.) So I popped one in the Dart and compared. Though the light color was closer to HID, they were not as bright as the 9012's that are stock. This is largely because of the way the 9012 is designed. When you are purchasing HID kits, I very strongly recommend against purchasing from VVME or XenonExperts. VVME provides extremely low quality products, and with shipping costs, the warranty is essentially worthless. XenonExperts sells a product almost as bad or worse, and won't even respond to warranty replacement requests. There are two places where I DO recommend purchasing from. My personal favorite is DDM Tuning, but I am also impressed with Morimoto's products, (though they cost quite a bit more, I will probably get the relay for my DDM kit). Another thing to be aware of, is that our headlamps are reverse-current. 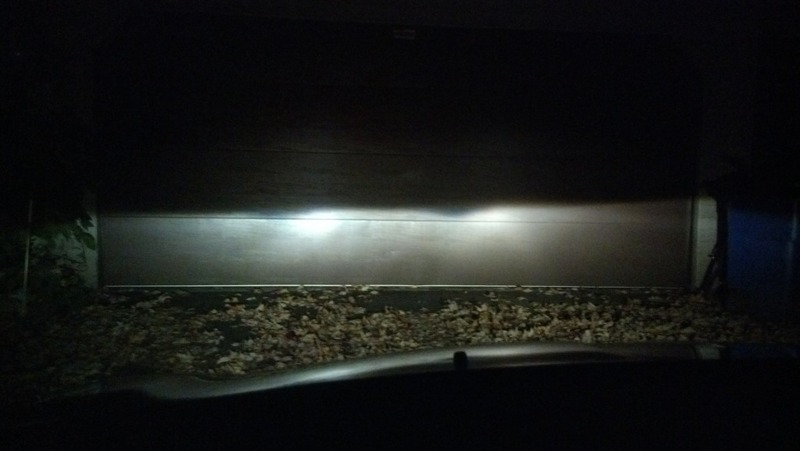 With regular halogen bulbs, this does not make a difference. 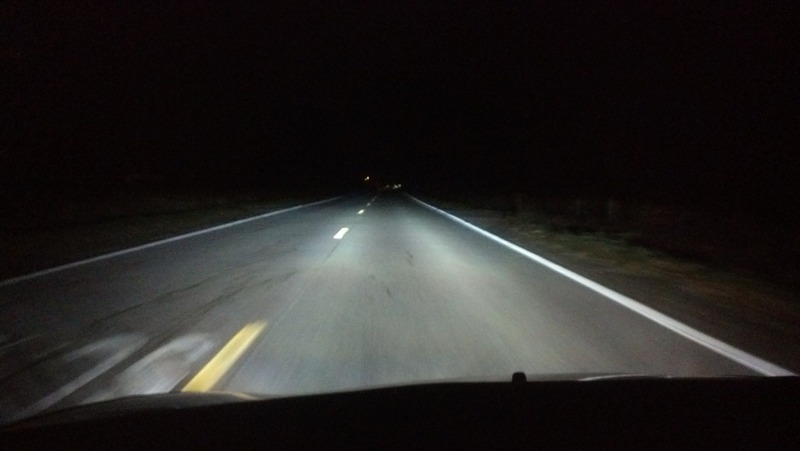 When using HID's though, it is something you need to be very aware of. If you plug in an error-eliminator with the voltage reversed, it can cause the capacitor inside to literally explode. It can also wreak havoc on the efficiency of the HID ballast, which can cause it to not work at all, or can cause heavy flickering. Here's some comparison photos. I'm using the Spoiler tag to keep this post from being an even greater wall. Spoiler: Expand for comparison images. The road shot. You can easily see how the left side is poorly lit, while the right side is normal. As you can see, (if you expanded the spoiler), the SilverStar is whiter, and closer to an HID color, but not as bright as the stock bulbs. As a result, you're going to have a shorter view distance with them. The ZXE's will be slightly bluer in color than the Ultra's and a smidge brighter. Personally, they aren't worth the extra cost and are more for getting the HID look without having HID's. You aren't going to have better visibility with them. Both have about half the life of a standard bulb, which is about a tenth of the lifespan of the stock bulbs. Either way, it would appear that it's rather pointless to go with a non-stock bulb unless you get a true HIR halogen, or HID/LED. Finally, this wouldn't be complete without a proper document on how to aim your headlamps. Hopefully this will help. The plate in the middle between the light bulb and glass is there to make the difference between high and low. It cuts the reflection from the bottom up. Ok, the first rule of thumb is, "you get what you pay for", most of the time. My first experience with HID systems was with VVME, and I must say, those are some f the worst quality I have ever experienced. I'll start out by listing the manufacturers that I have dealt with personally, and will update this list as I am able to work with others, or get input from you guys. VVME: Super cheap. As I stated above, they are pretty much crap. Their newer ballasts aren't as bad as they were, but they are still very prone to failure. The warranty doesn't cover shipping, and round-trip to China will cost you more than a new ballast. Also, their bulbs are not color-true. Most of the time they end up more blue than they should be. XenonExperts: As near as I can tell, this guy is drop-shipping the same crap ballasts VVME uses. Also, he absolutely will not honor his "2-year warranty". Any attempt to contact him is futile, and he will just blacklist you on Ebay, or whatever other site you purchased them through. Autek: I purchased a set of these Can-Bus ballasts from Amazon. The only good thing I have to say is that they eliminate the error message. DO NOT purchase the 35W ballasts if you expect to get a HID system that is brighter than the stock bulbs. Their 55W ballast is rated at 55W power draw, but the output is closer to about 30W. If your bulb color is anything other than 4300k, you will have a reduced light output. I really hate to see what the output from their 35W ballast looks like. Also, they only have a 90-day warranty, and have a tendency to fail after about 100 days. I did not bother trying to have it replaced purely due to the low quality and output. DDM: So far, this is one of the best companies I have had the pleasure of working with. The products are good quality, the light output is what the ballast is actually rated at also. My favorite part is the lifetime warranty on their ballasts. The only negative I have so far on the company is that their bulbs are not always color-true. Hues tend to lean towards the bluer side, but they aren't nearly as bad as VVME. They also just released a new Ultra kit, and Can-Bus ballasts. I have yet to test them, but I have no doubts about them performing to the same expectation that DDm has already earned for a good quality product. JeffL, starscream5000, J.Wal and 4 others like this. Great post, beans to you. Also, (because someone will ask eventually), the reason I included the 9006 bulbs is because that is the closest cross-reference for aftermarket bulbs when you can't find 9012's. However, since most of them require that the tips be blacked out for the reflector housings, the 9005 is another alternate. (Though, with the 9005, the center seal is smaller, so it will fit, but it will not form a seal and it would be possible to get water in or for the housing to fog with it.) Also, the 9005 is typically the high-beam bulb to compliment the 9006, and since we use the same bulb for both low, and highs, it provides a nice comparison for an industry standard. I used the SilverStar Ultra as a reference because it is a very common bulb that I have had a lot of experience with. (Though getting the hard tech data on it is a PITA, but I've done this before.) Other bulbs such as the Philips Extreme Power, or other Extreme White/Blue bulbs have a similar life span, though the luminance and color may vary slightly. I think I was most surprised by the LED bulb stats. I was really hoping to see more Lumens from them, so I was a bit disappointed there. Depending on where you live, the color may or may not be helpful without much of an increase in Lumens when compared to stock. I have read reports of the light basically being "washed out" during sunrise/dusk because of the lack of contrast with the sunlight. That would depend on road conditions, weather, and your relation to the sun though. Lastly, I know I've seen a lot of people refer to 4300K as "true white", but personally, (and I think Daniel Stern has a writeup on this somewhere), 4800-5000k is going to be the purest white you can get. 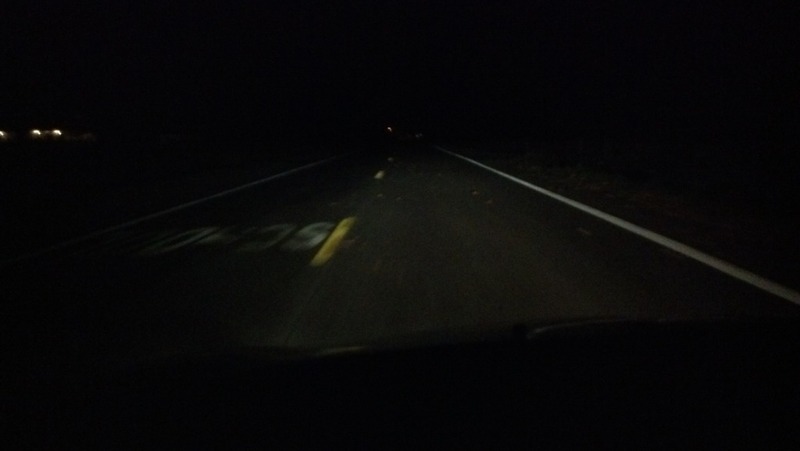 As noted, I personally run with 6000k, but with the 55W ballasts the light on the road is an almost perfect white. It does have a light blue tint in the pods, which I used to like, but I'll be ordering some new bulbs soon, both for testing, and because the blue will clash with some near-future lighting mods I have planned. Performance: AEM Cold Air Intake, Injen H/C Pipes, RRM Stage 3 Tuner, and Sprint Booster. I was playing around with the bulbs today and noticed something. 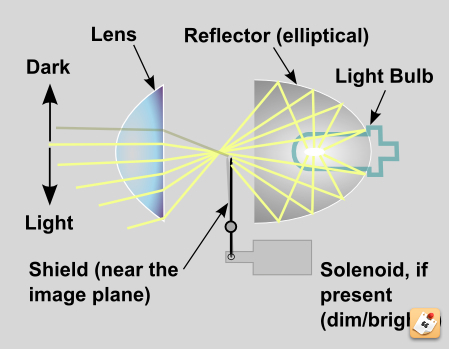 Bulb position in the housing has a huge impact on the projection of light. A lot of projector housings it doesn't matter much in. A lot of the BMW, Mercedes, and even my Smart, pretty much as long as the light is in the general area, there's not a change in the projection. I discovered today that that's not true with the Dart. I was driving this morning and noticed that the left side was a bit dim. Figured I might have had a bulb going bad. (Wouldn't have surprised me because the HID bulbs I used in the Dart were already almost 10 years old.) However, it looks like the wire just got tugged, the bulb spun a bit and was loose in the housing. As a result, it had gotten off-center by a small amount, and that completely messed up the projection of the light. I poked around with it for a few, and pretty much, if the bulb wasn't in the exact spot, the light output was either weak, or distorted. This does not bode well for most LED headlamps I've seen. Will be interesting to see what DRP comes up with. wow, that is a very helpful info! Thank you, I'll be waiting for LED or may be will switch to HID kit, if there is no any issues with it. Also, which HID kit is the best and plug and play ? Okay so if I'm not interested in messing around with HID system, what would be the best bulb to buy to be brighter or equal to the stock bulb? Headlight and fog lights? is I LOVE my car!!! Keep stock. Nothing is better than stock, except HID. By ezzekial11 in forum Misc.